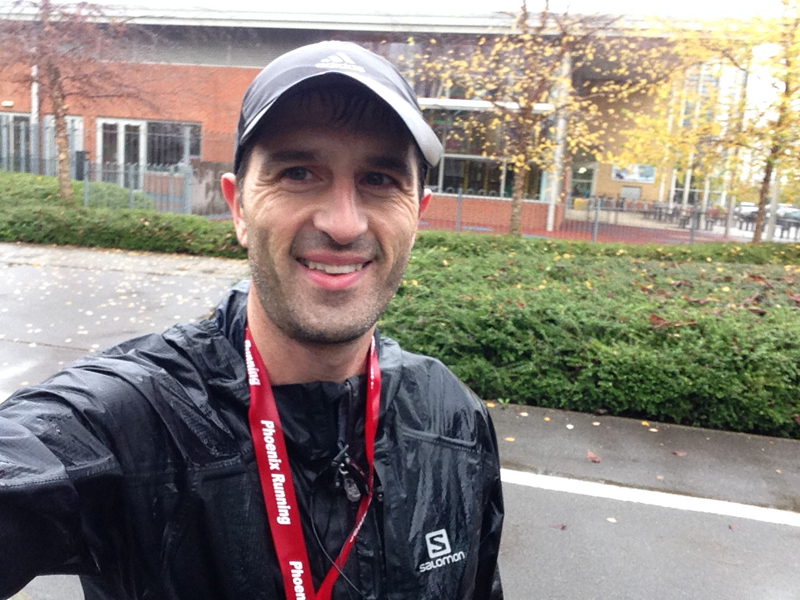 Today I ran the inaugual Phoenix Marathon (website here) from marathon regular Rik Vercoe. The event was in my diary as a training event after all the bigger ultra marathons this year just to ensure I kept ticking over. This was before I decided to have a bit of a break to rest the knee niggles which I had been suffering with throughout the year (and admittedly failed to rest at times when events just kept coming up). I’ve had a pretty good couple of weeks break, tried to survive on 1 long run a week so I didn’t go out of my mind but did end up plodding a short distance home as part of my commute so lets just say it was half a rest ok? The knee (unsurprisingly after some rest) was feeling a little better and todays marathon was a good reason to test it out. The Phoenix Marathon is run along the Thames Path starting in Walton on Thames and is a series of 4 out and back legs. It’s a small affair with around 50-60 odd people entering the Marathon. There was also a Half Marathon option. The weather forecast was grim and I drove to the event in heavy rain, ran the event in heavy rain and drove home in heavy rain. It was one of “those”days where there was no let up. After arriving at registration to the usual questions of “Isn’t this a little short for you?” and “Did you bring that bloody hat?” I registered and got myself ready for the start with an intensive set of knee warm up exercises.. Ah no, that’s what I should have done. Instead I said hello to a couple of people and hung around near the start. There was no race plan today, it was simply a case of running comfortably and seeing how I felt. We set off promptly at 9am as I settled down into the mid-pack before creeping forwards a bit. The out and back legs were just over 3 miles in length which I found ok as it helped me compartmentalise the race into segments. I decided to take the first leg pretty steadily and then go from there. The knee felt ok and I ran the first leg between 8.20m/m – 8.30m/m. On the way back I started to see the lead runners heading towards me. The conditions on the path grew worse as the race progressed with people tip-toeing around puddles at the start to charging through pools of water at the end due to the relentless rain. Everyone got soaked and there were several people who had to pause briefly to grab extra jackets and one person even donned a bin bag towards the end. I’m not sure there was any reason why but my second leg was quicker dropping to just under 8m/m on average as I continued to pass the same group of oncoming people each leg. The third leg was my quickest with the pace creeping down towards 7.30m/m although the lack of decent training meant that I started to fade on the fourth leg with the pace back up towards 8m/m. In fact the last 3 miles felt like a bit of slog but wasn’t quite as painful as the 3 mile drive along the M25 to get onto the M4 an hour or so later. I ran most of the race by myself as it was just a case of settling into your own pace but seeing people coming back toward you (and you doing the same to others) meant there was lots of hello’s, nods of acknowledgement and a bit of encouragement from people. I finished the race in 3.28 something and was pretty pleased that the knee held up and the time, particularly after little regular running recently and a little bit of weight gain partly due to inactivity and mainly due to the fact that I love cake. The fun of the event was tarnished a little by the weather which made everything a bit of a slog but it was good to see some determined people out there despite the conditions. The second Phoenix Marathon is scheduled for the 28th December and I jokingly asked whether my cheque had been cashed as the weather could be worse! The knee is a little stiff but will give it a day or two’s rest and then make a decision whether to start building up the training or ease off for another week or two. Thanks to Rik & team for organising the event and hello to the few people I spoke to during the run.